First let me say that if you ever find yourself in Nepal with a desire to trek, but only have time to do one… do this one. It’s the most popular trek in Nepal for a good reason. Compared to the Annapurna Circuit, I thought the scenery was better, the trails were more exciting, and that the general quality of the services (lodges, food, heaters) was a grade above Annapurna (Ben concurred). Of course, popularity comes with a price… almost everything on the Everest Base Camp Trek was more expensive than Annapurna, and, unsurprisingly, there’s a lot more tourists on the trail and in the lodges. Speaking of tourists, one thing I found interesting was the different type of tourists the two treks. On Annapurna, the vast majority of tourists were independent traveler types, mostly younger (or youngish… mid-thirties and below), very few people hired guides (maybe an occasional porter now and again), and most people fit the Israeli/European backpacker mold (I’d say that if you had to pick the median Annapurna trekker… he’d be a 25-year old Israeli/Western European backpacker). In contrast, on the Everest Base Camp trek, most people were from the native English-speaking world… being North American (Amurican, or from Canadia, but not Quebecois), Australian or UKish (English, Scottish, Irish… and yes, I know Ireland’s not part of the UK, hence the –ish). And 98% of people were either part of a tour group, or had at least hired guides and porters… really… there were very few people going without a guide as Ben and I were. So much so that at every army/national park/whatever checkpoint the guy behind the counter would ask our nationality… American… then they’d ask us if we had a guide, and when we said no, they get a very confused look on their faces and keep repeating the word no, but followed by a question mark (“no…?”). Additionally, the age demographic of the trekkers here skewed much older… most people were somewhere in the mid-40s (so the average Everest trekker would be a 45-year old American on a holiday-type). Feel free to insert your own inferences here… but, in general, I’d just say that I’ve found that those with more money than time generally opt for the convenience of a package tour while those with more time than money generally opt to do it themselves. The contrast was very interesting (I also really enjoy seeing differences like this in cultures, even if it’s just tourists v. tourists instead of tourist v. natives, and how they play out in various places abroad). 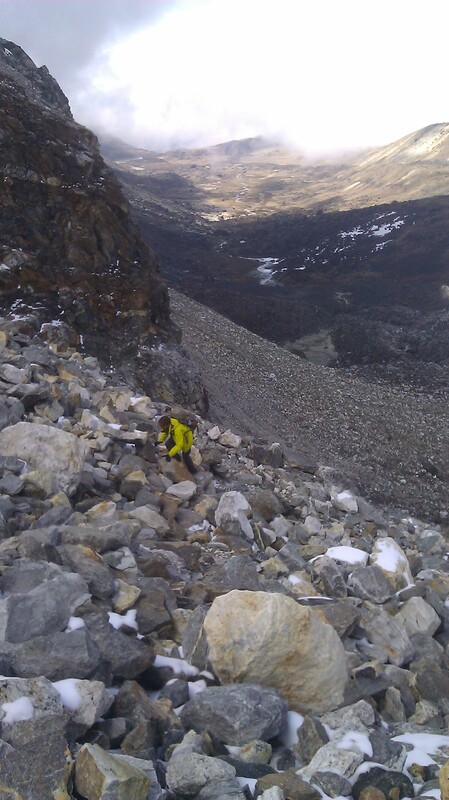 One nice thing about the Everest Base Camp trek is that you can fly in. For the Annapurna Circuit, you have to a take a rather long bus ride to the beginning (and for some reason, I dislike buses in Nepal more than any other country I’ve been in so far) then hike for about 4-5 days before you actually begin to feel like you’re in the Himalayas. Here, after landing, within either one long day of hiking or two short ones, you can really feel you’re all up in this business. Now… you could take a nine hour or so bus ride from Kathmandu to a town named Jiri and walk 5 long days to reach the town with the airport, which some do. Generally, I try and adopt the philosophy of “if you’re going to go… you might as well go all the way,” so part of me really wanted to take the bus to Jiri and walk in, but I’d heard that those five days were supposed to be particularly grueling (everyday involves a huge climb and subsequent descent as you pass from one river valley to the next). However, as both Ben and I had already walked 20+ days each on the Annapurna Circuit, we figured we’d opt out of “grueling” and opt for taking it easy on this one (for those of you wondering why anyone would willing do something pointed out to be particularly grueling, the charm, reportedly, is that you’re able to see how the trekking route was before it evolved into a major tourist phenomenon… you, know, like seeing actual Nepali villages that aren’t just full of trekking lodges). On an aside… do you get squeamish on airplanes? Well then my friend, you are not going to like these flights. First, they’re small planes, two propellers, 16 seats… one per side in eight rows… and if you’re taller than a midget you won’t be able to stand up in the aisle. On our flight out, half our plane on the way out was loaded up with sacks of rice and onions and what I believe was one box of angry birds wool hats for delivery. If you already weren’t a little worried by all that, just before take-off, the stewardess comes around with wads of cotton (for your ears) and mango-flavored candy (for the pressure), which somehow just makes the whole thing feel a tad bit more ridiculous. Now, once in the air, you can see out the front window of the plane, so you can watch the pilots steer through clouds and around mountains. You can also see the pilots GPS system, which turns red when you’re within 100 meters of a land mass or yellow within 1,000 meters… so you’re looking at it and it’s mostly yellow…. then it turns red and you grip your seat cushion a bit harder… then back to yellow so you relax… then back to red where you panic a bit, then back to yellow…over and over again. The planes only take off and land when there’s good weather, which, if it’s good, is only in the mornings (too much wind in the afternoon and almost zero visibility as it clouds up)… so you get to play a bit of a fun waiting game at the airport to see if you’re actually going to leave (we had to four hours for clear skies the day we left Lukla to come back to Kathmandu). On the way there we actually left on time, and I snoozed a bit (it’s only about a 45 minute flight and I’m a good plane sleeper). I awoke as we approached the landing, but noticed the plane wasn’t really descending… then I peeked out of the front window and figured out why. 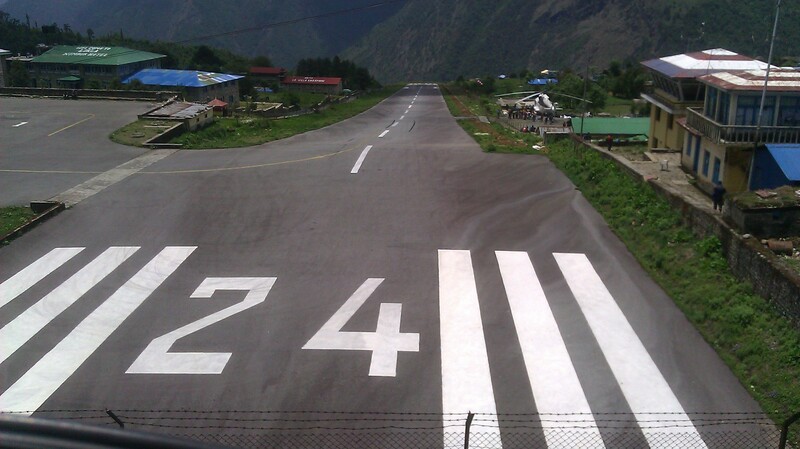 The runway at Lukla is pretty much built straight into the mountainside… so no need to descend, you can only hope that the plane stops before it crashes into the giant wall/mountain at the end of the runway (which, of course, it did). After we landed and disembarked, since the weather window is limited, they loaded that sucker back up in a hurry (granted, it’s a small plane). They move so fast that the pilots don’t even turn off the propeller on the far side of the plane (away from the un-loading side… they, courteously, turn that off the propeller on that side of the plane)… after everyone and everything is on board, the one engine gets fired back up and the plane is off again for Kathmandu. The whole process takes about ten to fifteen minutes, which is quite impressive to watch (the takeoffs are nice as well since the end of the runway just goes off a hillside… very Golden Eye). Aside over… back to your regularly scheduled programming. Ben and I knew immediately upon our arrival that this trek was going to be bit more high end than Annapurna… the look of the trekkers (fashionably clad in actual non-fake goretex gear from head to toe with a marked lack of dreadlocks), the look of the stores, the availability of more than one “Herman” bakery (the engrish take on the word “German”), the fact that there was more than one bar (three even… bars were non-existent on Annapurna) and that there was a faux Starbucks so convincing that we couldn’t tell it was fake until we saw the menu (the coffee was even bad… just like the real thing ;-)… indeed, a brave new world over on this side of Nepal. Given the 10.5-hour bus ride we had to endure the previous day (from Pokhara to Kathmandu), the early morning flight from Kathmandu to here, and the sensory overload of so much stuff jammed into a Nepali trekking village, we decided to just relax the day away and begin trekking tomorrow. Later that night, we even ended up spellbound in front of the TV in the common/dining room of our lodge. It was the first one we’d seen in weeks, and I kid you not when I say we both were literally mesmerized by Rise of the Planet of the Apes. Now, if you can imagine/picture the Annapurna Circuit trek from above as a circle, then you can picture the Everest Base Camp trek from above by looking down at the palm of your right hand… sans thumb. The center of the Everest region (Khumbu is name the region) is town named Namche, which would be your palm. Each of your fingers (again, sans thumb) is a valley with a trail going up it. 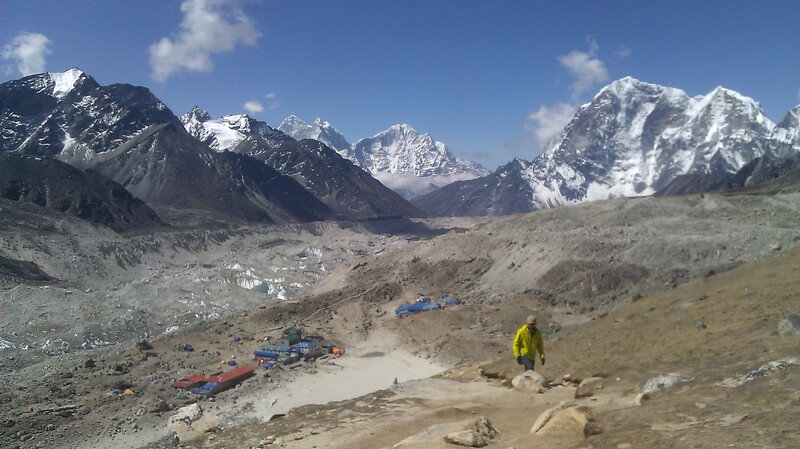 Everest Base Camp, and the foot of Mt. Everest, is located at the tip of your middle finger, so the main trail runs from your palm to the tip of your middle finger. Each of your other fingers is a valley, and one can cross from each finger/valley to the other via three mountains passes that connect adjacent valleys, which cross somewhere between the second and third knuckles of your fingers (making sense… oui/no?). If you want to kick it up a notch analogy-wise, put your arm perpendicular to the floor (palm up), then tilt your arm upwards from your elbow so that your arm is now about halfway between perpendicular to the floor and straight up and down ( a 45-degree angle). Now, if you managed to do that like I think you should be doing it, your fingers are now higher than your palm, which is higher than your wrist, which is higher than your elbow… still with me here? This new angle is the altitude change involved… as you get further towards the tips of your fingers, the higher up altitude-wise you are. 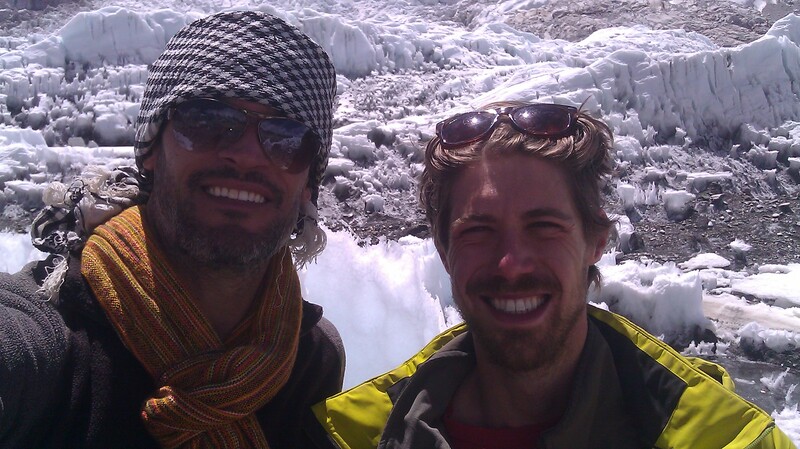 Now, Ben and I landed in Lukla, which would be somewhere below your wrist. Our plan was to hike to Namche (your palm), then go up the Gokyo valley (your ring finger), cross over to Cho La Pass to the main trail (your middle finger) and head up to Everest Base Camp from there (as we had heard that the Gokyo Valley is much prettier than the main trail-scenery wise). 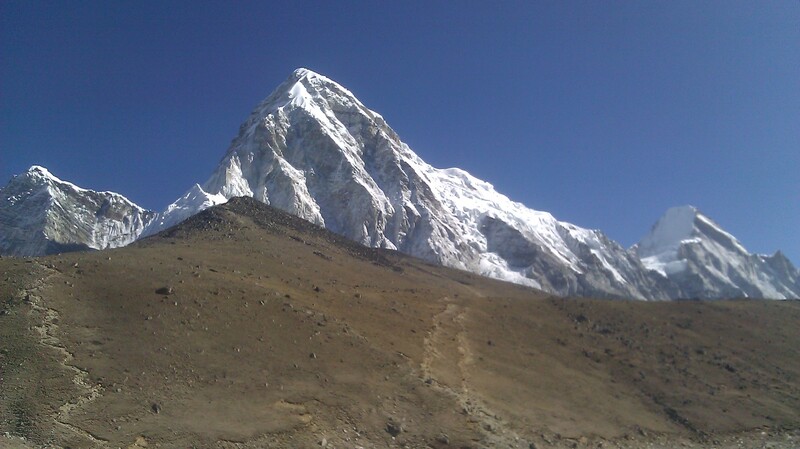 Now, one thing about the Everest Base Camp trek as compared to the Annapurna Circuit trek is that with Everest, you get much higher (I’m talking altitude here people) much faster, and stay there much longer, than one does on Annapurna. For example, on Annapurna, Ben and I were above 4,000 meters / 13,100 feet 5-6 times in 24 days, and we only slept above that level 4 nights (and we only went above 5,000 meters / 16,400 feet once, when we crossed Thorung La Pass). On this trek, we were above 4,000 meters for 8 days out of 12, sleeping above that level 5 nights, and we went above 5,000 meters 6 times (sleeping above that level for one night). 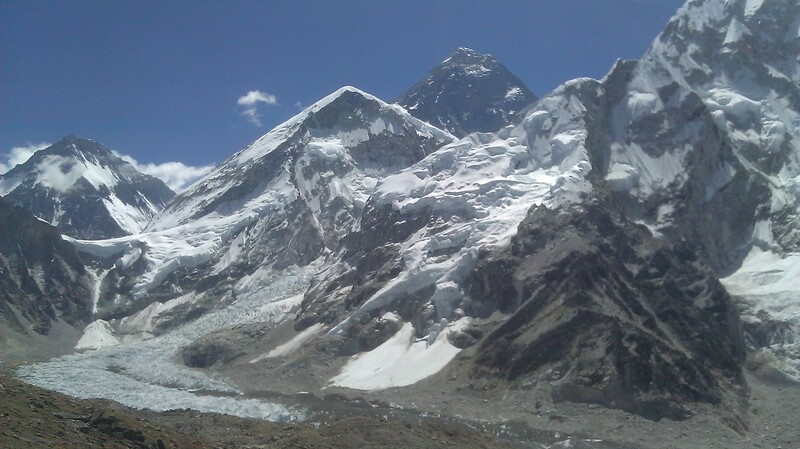 So, given how much higher in altitude the Everest region is, one becomes just that much more susceptible to getting some form of Acute Mountains Sickness (AMS, or altitude sickness… the extreme forms of which can result in fluid build-up in your brain or lungs, which can lead to death… and several people die every year in/around Everest Base Camp). There are signs posted and literature everywhere on AMS, but the thing is, AMS is based on your personal body chemistry… so you never quite know how you are going to react until you’re all up in it at high altitude. Now, I know how I work after having spent some time earlier in this trip going up into some pretty high places and having just done Annapurna I thought I’d be fine, but we both felt we should take it slow to start with (I know, with regards to AMS, that I am generally fine going uphill, but get mild to bad headaches going downhill after being high and I’ve never had any real breathing problems… I, apparently, am the opposite of most… Ben, like most others, feels sick going uphill and better when going down… I must be a special snowflake). 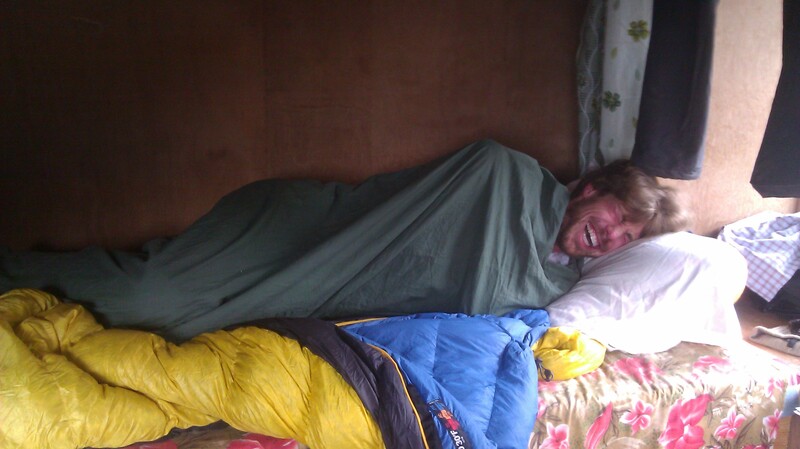 The only real way to prevent AMS is to go up slowly… the recommended guidelines are to sleep no higher than 400 meters above the last place you slept, and to take one rest day for every 1,000 meters in elevation gain. 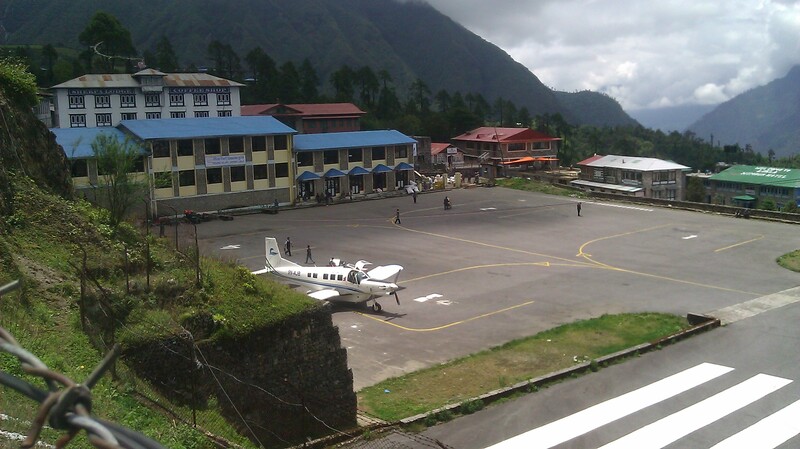 Lukla, where Ben and I flew into, is at an altitude of 2,840 meters (9,315 feet). Now, for various reasons mixed with a little bit of stupidity, four days of walking later we found ourselves at Machhermo, which is at an altitude of 4,470 meters (14,660 feet), with all of the elevation coming over the last three days. We were clearly abusing the how not get AMS guidelines (550 meters a day and no resting). Almost the entire last hour we spent walking into Machhermo, I was extremely light-headed and dizzy… which is not good. Luckily (thank you impeccable timing), Machhermo has an aid station staffed by British medical volunteers, and they were having a talk on AMS at 3 PM that afternoon. So I took my light-headed self over to the talk and learned that I was exhibiting very mild signs of AMS, but nothing to worry about (just needed to continue monitoring myself). They even measured the oxygen saturation in my blood, which was at 91% (very good at this altitude and better than many of the folks who had already stayed a whole extra day in Machhermo just to acclimatize, which made me feel better). When I woke up the next day I felt tip top and ready for some more elevation gain. Now… before you get all freaked out, it’s not like Ben and I weren’t taking the dangers of AMS seriously… it’s just that we had actually acclimatized on the Annapurna circuit (and that doesn’t go away instantaneously), so we could go faster than most folks (we were planning to stay another day at Machhermo if I didn’t feel better in the morning). Looking up the Gokyo Valley. As I mentioned above, Ben and I chose to go up the Gyoko Valley (the ring finger) as opposed to taking the main trail (we’d take that back down) because we had heard the scenery was better and that there were less tourists (a good thing in our opinion). Although we didn’t actually know what the main trail looked like, we thought that the general consensus was right, as the valley was beautiful (see photos). The general weather pattern up is clear mornings, followed by clouds rolling in around 11. By 1 PM it’s gray, and there’s always a decent chance of snow/rain for a bit in the afternoon. Unfortunately, the two days we spent trekking/staying at the top of the valley (on the way to/from Gyoko village) it was as foggy as a San Francisco summer day. So we never got to see these views, but given the landscape, it was just as cool to walk all by ourselves in the fog. Also as I mentioned above, there’s a series of mountain passes connecting the valleys together. Unmentioned above though, is that there’s a route on the trek called the “three passes” which makes a point to cross each one (in the hand analogy, you’d go up the pinky, cross over to the ring finger, then to the middle finger, then up to Everest Base Camp, crossing over to the index finger on the way down back to the palm/Namche, or the reverse if you’d like). I’d seen it mentioned in several places, but given that I knew we were going up the Gyoko Valley, I didn’t think it would be feasible to do all three (I knew we’d be doing at least the one between the Gyoko Valley and the main trail). However, once we got to Gokyo Village, I realized that Renjo La Pass, which crosses from the pinky to the ring finger, terminated at Gokyo. So, theoretically, I could go up from Gokyo, touch the pass and come back down the same way… I was going to cross Cho La Pass anyhow given the route we took, and then I could cross Kongma La Pass on the way down… so why not give it a go? Plus, when I woke up that morning, it was socked in fog-wise, which would make climbing Gokyo Ri not quite as rewarding (Gokyo Ri is a small, relatively, peak, from the top of which one can see Mt. Everest). No one could really give me a definite time table for how long it would take to go up and back to Renjo La (I heard anywhere from 4 hours to 7 hours), but based on the map and my past trekking experience, I figured it would definitely be more on the side of the 4-hour mark than 7 hours. So I set off by myself (a general no-no when trekking up here… especially in the fog, and later snow… a Nepali guide on his way up to the pass, whom I passed on my back down, gave me a stern wag of the finger when he found out I was alone). But, other than a moment or two of temporarily losing the trail, and one slightly shady snow ledge crossing, the way up and down was really nice. It was snowing at the top so I couldn’t see anything, but I had made my first trip above 5,000 meters on this trek, and I’d gotten up and down in less than four hours (2:10 up and 1:25 back)… which put me back in time for an early lunch (banana pancake again… the best one on the whole trek). 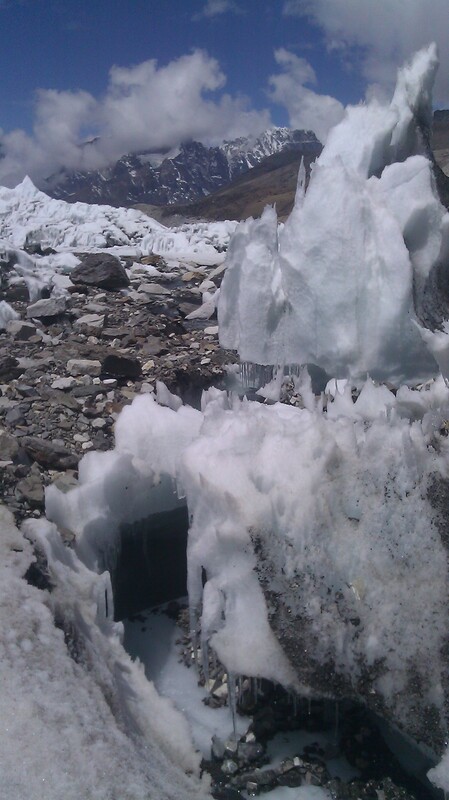 Later that afternoon, Ben and I traversed a glacier to stay in the lodge at the foot of Cho La Pass, which we would cross the following day. It was still socked in, but it was very cool to be walking on ice and listening to all the rock and ice falls along the way (just the nature of the terrain… there’s a constant movement of things… so it sounds to me as if the mountain/glacier is talking… very cool). The following day we got up to head over the pass (Cho La pass, which Ben and I kept calling chollo pass while making jokes about taking a picture on the top in our button up shirts with only the top button buttoned). 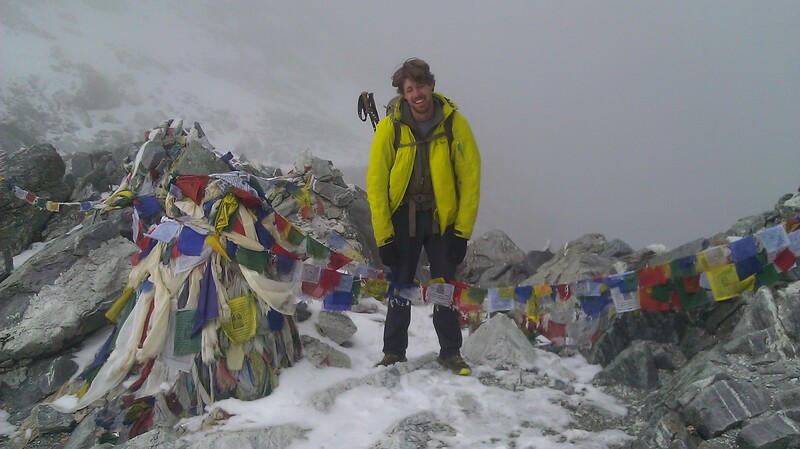 The first two thirds of it wasn’t too bad, and we reached a summit with a prayer flag faster than expected. Now, generally, prayer flags mean you’ve reached the top, but in this case, the prayer flags were on a false summit, and the real pass was on the other side of a boulder-strewn glacial moraine… and from where we were standing it looked pretty gnarly. The trail ended up not looking any better up close either… about 200 meters more of less straight up over a mixture of gravel, scree, rocks and boulders all covered with ice. We sat for a spell once we reached the bottom and just looked up at it for a while… the trail was easily the steepest one we had seen in our previous month of trekking. But at the same time, I think we were a little excited precisely because it looked so challenging… I mean, it’s not like we’re climbing Mt. Everest out there, we’re just trekking… so to have something that looked (at least to be) difficult made you really feel that this is it… now we’re really in the Himalayas (all the yetis and snow leopards sitting around watching us added to the feeling as well). We started up, and immediately had to resort to a combination walk/scramble by using our hands to pull ourselves up as we walked along. There was lots of slipping in the loose rocks, with the occasional slipping of a very large rock (I was ahead of Ben and did not want to send something big rolling his way), and the trail, more or less, disappeared in the large rocks fields, leaving us to plot out own path upwards. About halfway up, the rocks began to get really, really icy, so we had to use of our hands even more… but we just kept on, ever upwards, and finally reached the top of the pass. We were tired, but no worse for wear. It was easily the physically hardest part of any of our treks so far, so we spent about twenty minutes on the top enjoying the limited view from a small ledge (that we had to climb up another 30 meters or so to) above the actual pass. After some celebrating, we started out across a snow covered glacier for the descent down to the nearest town for lunch (an interesting note… our map pointed out that while crossing this glacier one should stay to the left to avoid falling into a crevasse… luckily for us, a lodge owner had pointed out that staying to the left only applied if you were coming from the other direction, and that we should stay to the right given the direction we were going… we found that most of the maps we had contained many similarly dangerous, but well-intentioned, pieces of advice). We pushed on through a fog whiteout and some snow in the afternoon so we could get to Everest Base Camp the following day. Now, by this point we’d been walking for seven days without a break… we were definitely tired, and would have loved a day off. But… you see… we had a slight problem… we were running out of money. Now, you might be asking yourself how on earth we could be so dumb as to not bring enough money for trekking when we knew there’s no ATMs on the trail anywhere past Namche? In fact, we were pondering the same question while in Gokyo… but, for several reasons which I will not bore you with, when looking at our decidedly thin stacks of Nepali Rupees we figured out that we could only really last about 5 more days with the money we had (this accounting was tallied on the 6th night). We had to come up with a plan to get up to Everest Base Camp and all the way back down to Namche by the end of the 5th day. So we broke out the map the night before crossing Cho La Pass to see what we could do… the conclusion… bye-bye any thoughts of a rest day. 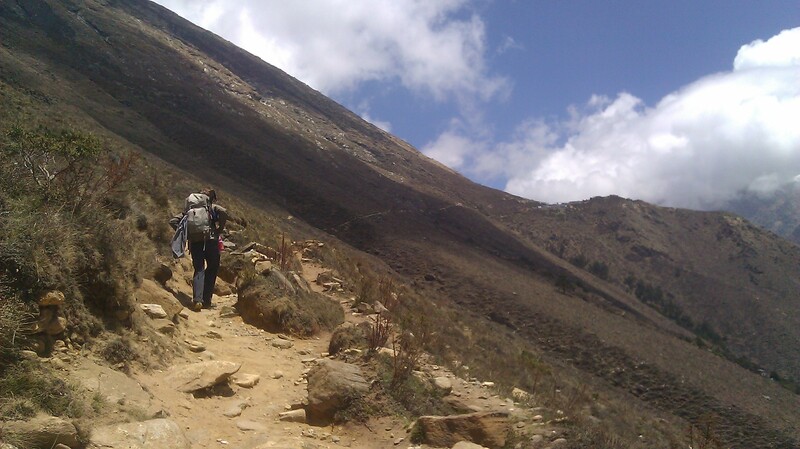 We’d also have to combine a couple of the guidebook ascent and descent stages to make things work… so hello increased risk of altitude sickness (we never ended up having any problems other than the “normal” altitude afflictions). Figuring that we could only walk uphill so fast, even when pushing it, we’d be better off combining a couple of the downhill stages into one long cannonball-run-style day of trekking pain… so we made our plan and went off the next day over Cho La Pass (the above is the reason we walked on that afternoon in the fog and the snow to get closer to Everest Base Camp). Now that we were over Cho La Pass and back on the main trail, our double-time-because-we’re-running-out-of-money trekking plan called for getting up early, heading to Gorak Shep (the last collection of lodges before Everest Base Camp), dropping off our stuff, then heading up and back to Everest Base Camp (you can’t stay at Everest Base Camp unless you are part of a climbing expedition, so all of the trekkers have to do a return hike to Gorak Shep for lodging). However, when we awoke, the skies were crystal clear (being the first really clear day in the past three). 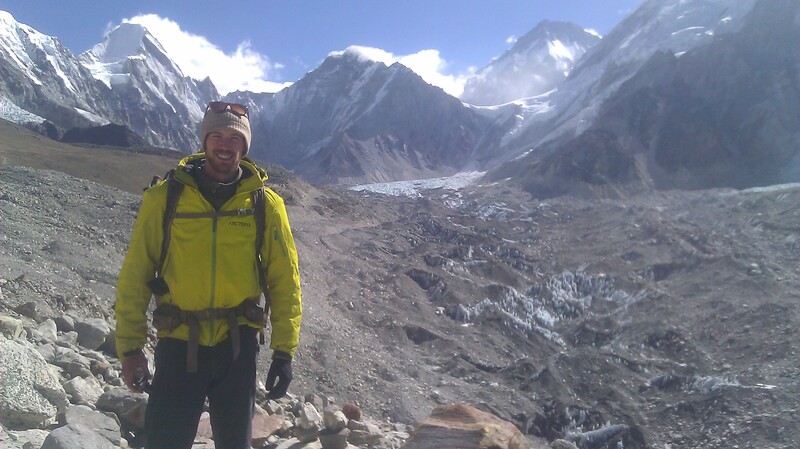 So, when we arrived at Gorak Shep we changed up our plan to instead head up to Kala Patthar, a small peak just past Gorak Shep renowned for it’s views of Mt. Everest (actually, it’s really the only place one can actually see Mt. 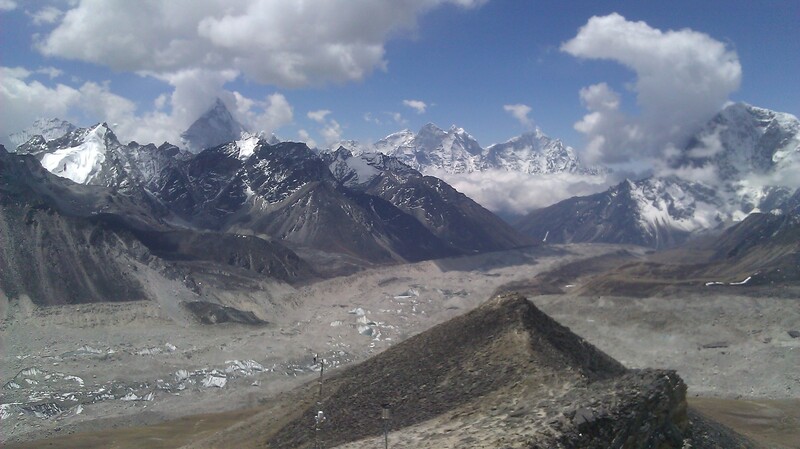 Everest, as you can’t see the mountain from Everest Base Camp). The climb took us a lot longer than we thought (the summit of Kala Patthar is 5,550 meters / 18,200 feet, which is the highest point reached on the Everest Base Camp trek and the second highest I’ve ever been in my life)… the trail is steep, the air is thin and we were both tired from the previous couple of days. However, we did manage to make it up before the clouds really rolled in… and it was beautiful. We must have just sat and stared for about 30 minutes before dragging our flagging selves back down for lunch in Gorak Shep (it was a good decision to go right up because by the time we had descended the sky was gray and it was beginning to snow… so we got to see the views of Mt. 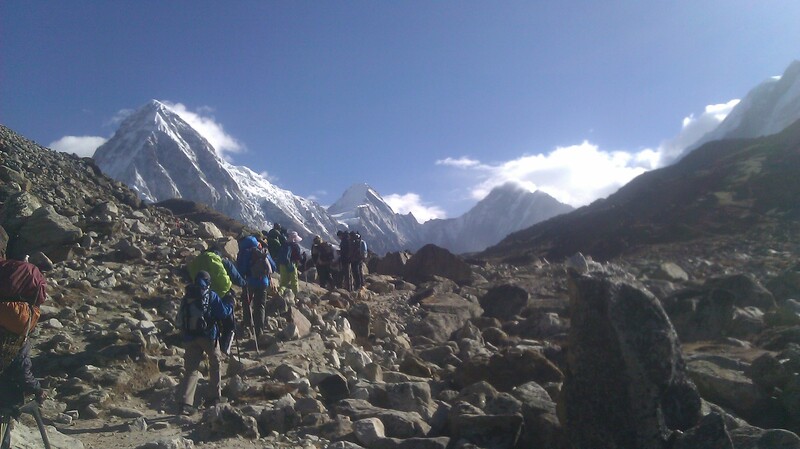 Everest and avoid doing the much longer hike up to Everest Base Camp and back in the snow). With some impeccable timing, the following morning also bequeathed us with some clear skies for our trek to the actual Everest Base Camp. Now… some guidebooks actually belittle base camp as a worthwhile destination… waxing on grandly about the sublime views of Mt. 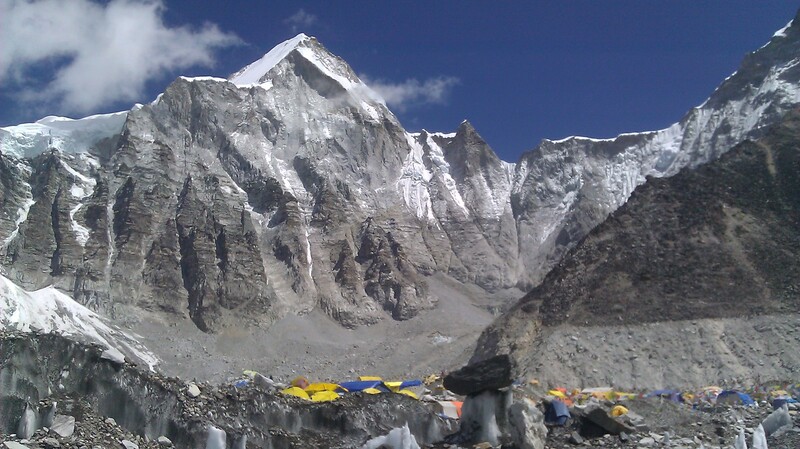 Everest from Kala Patthar and writing off base camp as merely a collection of tents. But Ben and I both thought the guidebooks were wrong… Everest Base Camp was one of the coolest things I’ve ever seen in my entire life. Yes, it’s a large collection of tents… lots of tents actually, they must have been spread out over 2 kilometers or so. 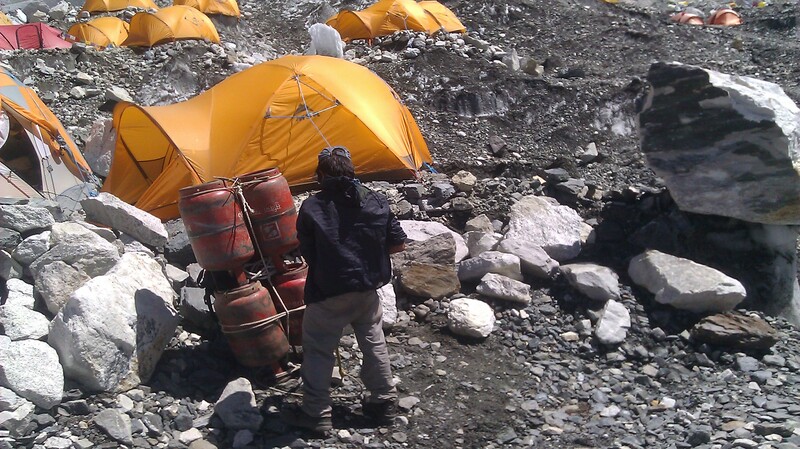 But it’s not the base camp itself that’s cool… it’s the location. 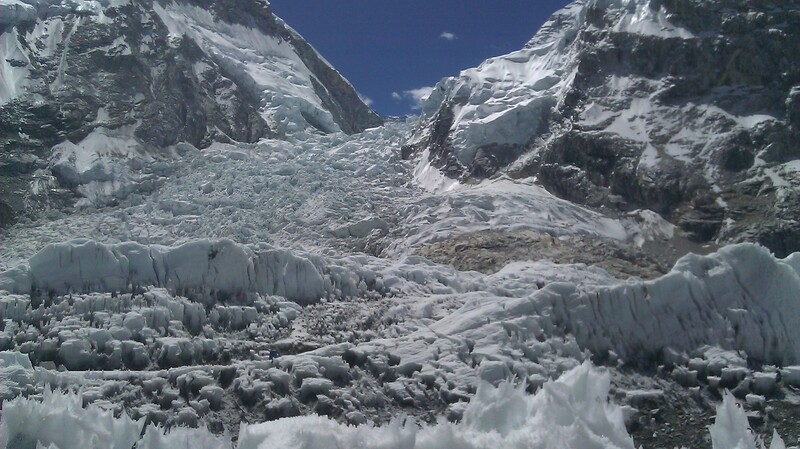 You see, Everest Base Camp is situated on a glacier, right at the foot of the Khumbu Ice Fall, which is a gigantic, craggy, sheet of ice that tumbles down the mountain towards base camp from above on the mountain. And the ice fall is a whole different world… a combination of Superman’s fortress of solitude, the moon, the winter Olympics and a water park. For those of you who have been in a cave with lots of stalagmites, that’s what the ice looks like… just millions of giant shards coming up out of the ground in various peaks and waves. And, because it was sunny, although the surface of the ice was white like snow, the interior was a very deep blue color, so the whole ice fall just seems to glow blue. Streams of melting glacier water crisscross the whole ice fall in ice-lined tracks that look like a combination between a bobsled track and a water-slide. The whole place is just amazing… so much so that I would not have been surprised to see penguins playing around, or a yeti having tea outside of his cave playing with his pet snow leopard, or something even more ridiculous that I couldn’t even imagine it until it would be right before my eyes. We wandered over a stream or two into the ice fall, picked some good sittin’ rocks, and just sat and looked around in wonder for about half an hour… a very nice moment to just sit and take it all in and enjoy. 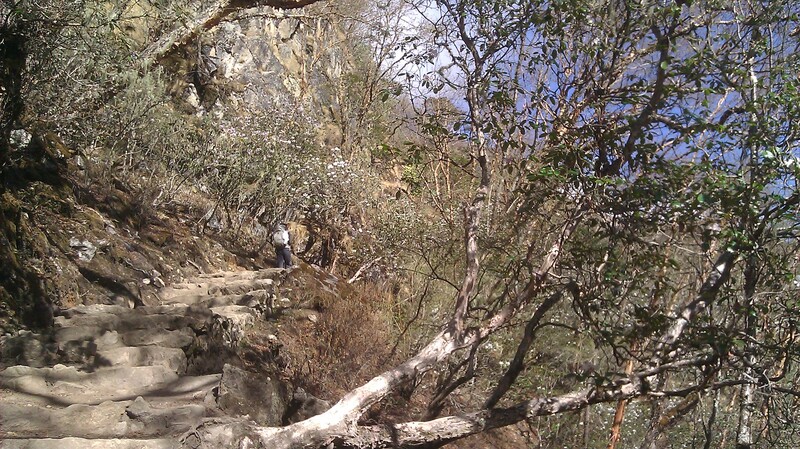 Eventually, we tore ourselves away and headed back downhill… the beginning of some long days back to Namche. We stopped in Gorak Shep for coffee, to pick up our bags (one of the nice things about out and back treks is that you don’t really have to carry anything but water and snacks) and to divide up our remaining cash. I stopped for the night in Lobuche to head over Kongma La Pass the following day (see here) and Ben continued on down the trail. After the pass I spent the night in Pheriche (where Ben had spent the previous night and where, in a cartoon-like moment, he managed to rip a sink clean off the wall by merely leaning onto it while brushing his teeth… sadly, nothing near that exciting happened to me). The following day I trucked it all the way down to Namche (this happened on the way), with not a second to lose either as I spent the last of my Rupees on lunch. Unfortunately, my impeccable timing struck me in reverse this time, as, while standing in front of the ATM all ready to get my hands on some badly needed cash, I figured out I had lost both my ATM card and my credit card somewhere during the previous two days… triple-shyte. After five minutes or so of frantically checking every crevice in all of my stuff, then letting it sink in that I had indeed gone and done something so horrifically stupid that it defied all explanation, I had a good chuckle and headed back over to our hotel room (what else could be done?). When Ben arrived I told him that I was going to tell him something which he would find hilarious after about five minutes… and, good on him, it only took three. Broke as a joke, we ran though all the possible scenarios we could think of for ways of getting some money… luckily the first one we thought of worked, and we had enough funds to get us back to Kathmandu. Eschewing further rest, the following day we made our last long hike back to Lukla to get on the waiting list for flights (walking the last hour and a half in the pouring rain). With a touch of luck we only had to spend two nights in Lukla, and we were, happily, back in Kathmandu before we knew it (both glad that we did it, glad that it was over and glad not be walking anywhere again for quite some time). 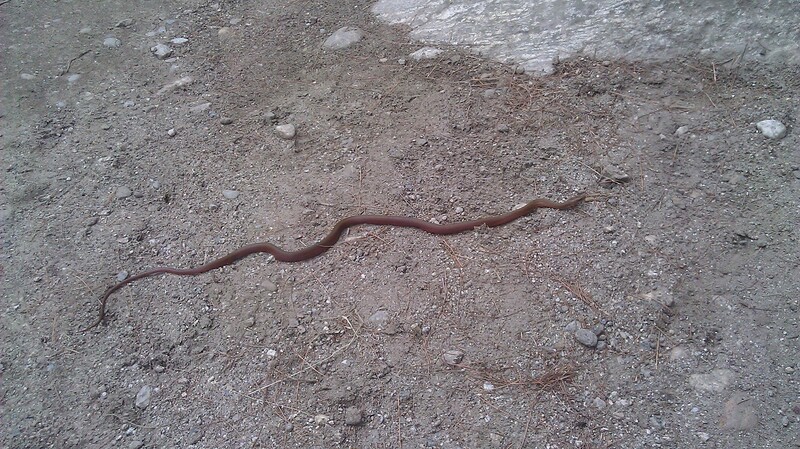 Day 1: Luka to Monjo – 10.5 kms, -390 mts descent, +350 mts ascent. 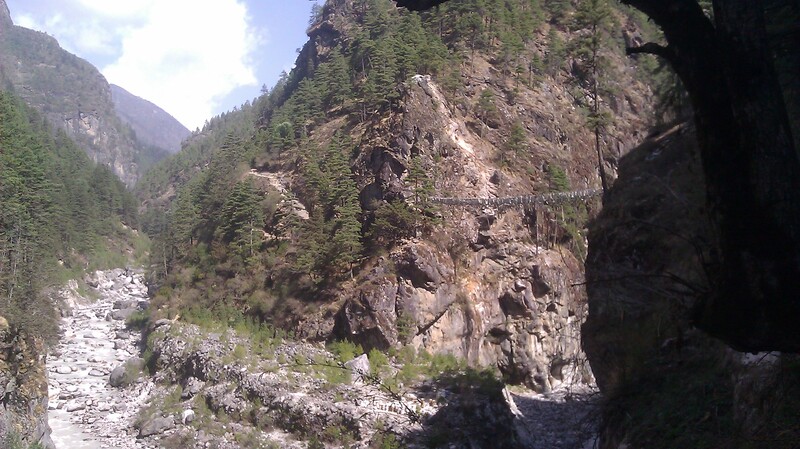 Day 2: Monjo to Namche – 4.5 kms. +690 mts ascent. Day 3: Namche to Phortse Tenga – 7 kms. +540 mts ascent, +300 mts descent. 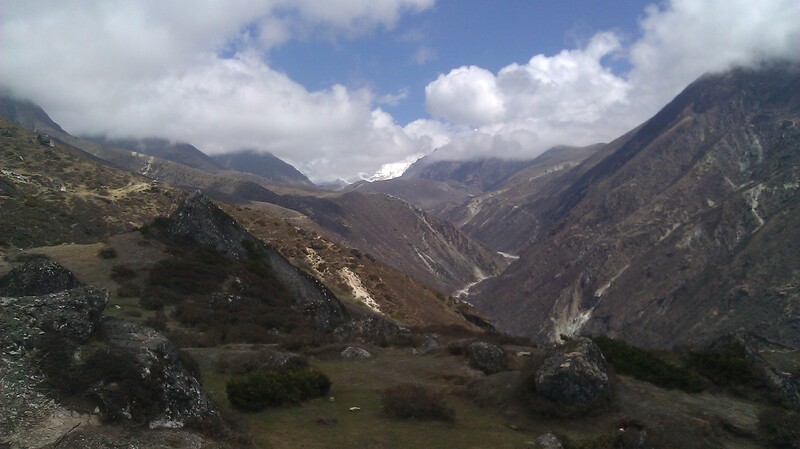 Day 4: Phortse Tenga to Machhermo – 7 kms. +790 mts ascent. 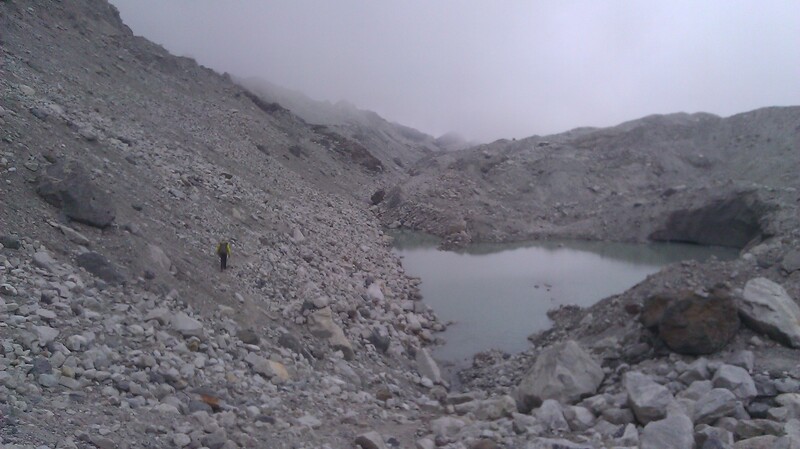 Day 5: Machhermo to Gokyo – 6 kms. +320 mts ascent. Day 6: Gokyo to Dragnag w/ Renjo La Pass – 12 kms. +550 mts ascent, -640 mts descent. Day 7: Dragnag to Lobuche via Cho La Pass – 13 kms. +800 mts ascent, -590 mts. descent. 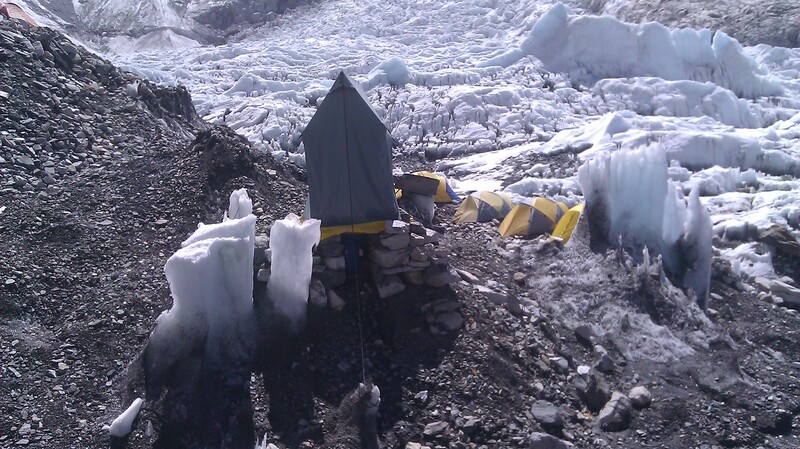 Day 8: Lobuche to Kala Patthar and Gorak Shep – 7.5 kms. +640 mts ascent, -410 mts descent. 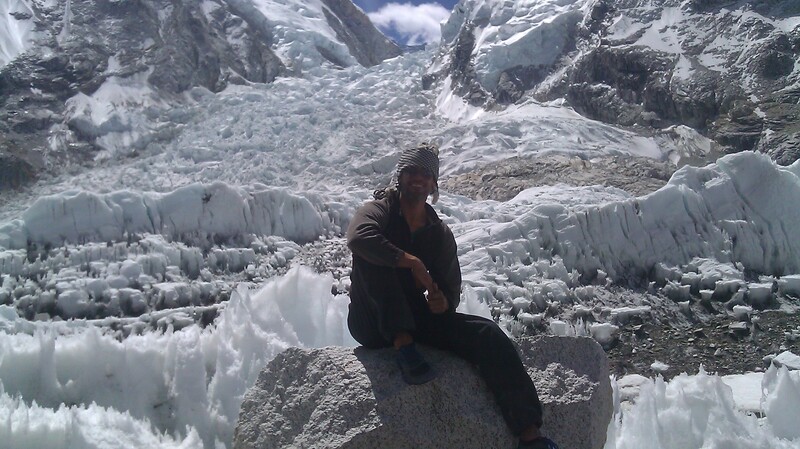 Day 9: Gorak Shep to Everest Base Camp to Lobuche – 13 kms. +220 mts ascent, -450 mts descent. 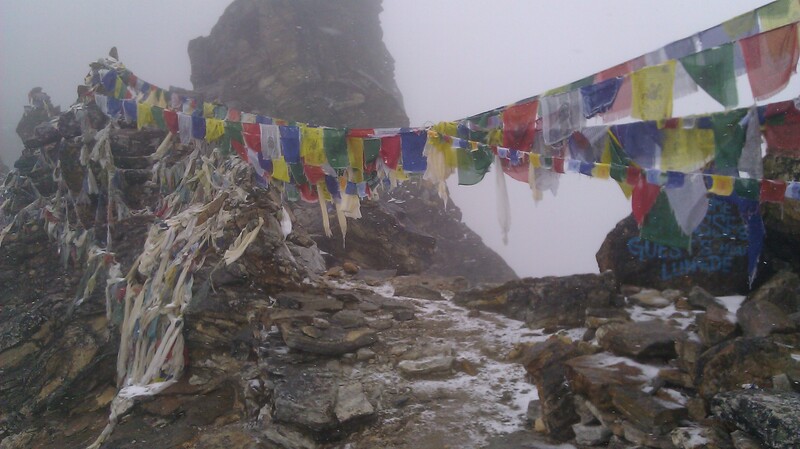 Day 10: Lobuche to Pheriche via Kongma La Pass – 11 kms. +625 mts, -1,265 mts descent. 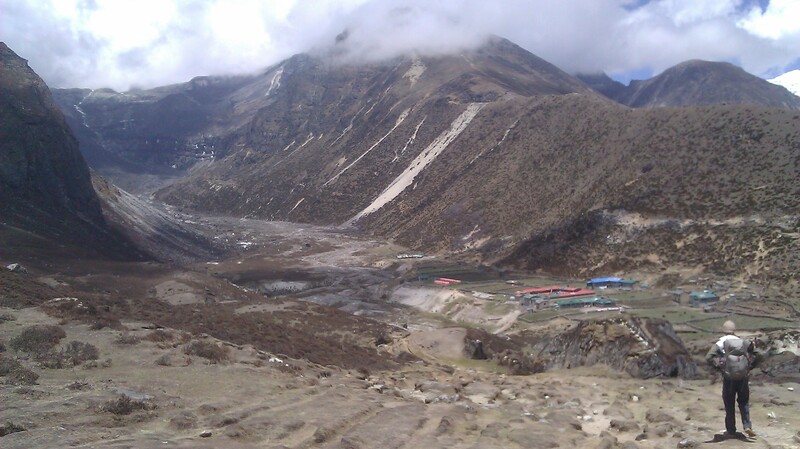 Day 11: Pheriche to Namche – 17 kms. -1,440 mts descent, +480 mts ascent. Day 12: Namche to Lukla – 15 kms. -1,040 mts descent, +390 mts ascent. Total Trekking: 12 days, 113.5 kilometers (70 miles) and about 6,395 meters of ascending (that’s about 21,000 feet, or 4 miles of climbing). You guys are mad! Love it though!